During Leaders’ Questions in the Dáil today Deputy Pringle raised the issue of union recognition by the Government and its state agencies. 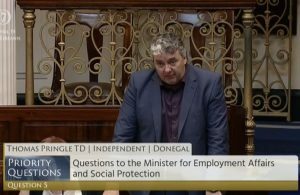 Speaking on the issue Deputy Pringle said “with strikes and threats of further strikes we are witnessing the culmination of Fine Gael’s incompatibility with industrial relations in this country and their blatant disregard for workers’ rights. “Fine Gael are refusing to meet with the INMO, the NAGP, the PNA and refuse to even recognise NASRA, the union of choice for ambulance crew. But Government agencies are reinforcing this. 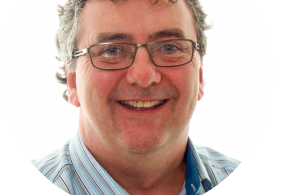 “In the case of Donegal, this includes Údarás na Gaeltachta which last week announced a year on year increase in job creation figures for 2018. However companies which withdraw grant money from Údarás have been known to refuse recognition of workers’ union of choice and refuse to engage in industrial concerns. For example workers at the Rapid Action Packaging plant in Gweedore who went on strike last year because their employer refused to recognise their trade union of choice. “To this day there is no way we can ensure employers are respecting workers’ rights because the imbalance of power benefits the employer in this regard. “It should be the case in 2019 that Údarás na Gaeltachta makes it a precondition for companies to recognise workers’ union of choice before grants can be issued to the company. “I believe that it’s time now that union recognition is granted once and for all to all workers in this country and not left at the discretion of the employer” concludes Pringle.